Right now it is Wednesday morning and I am feeling rested. For the last several weeks, I haven't been sleeping very well and am waking up at least once in the night from back pain. However, last night I slept through the whole night and I am VERY thankful for that! Right now I am eating scrambled eggs, a handful of grapes, and drinking half a cup of coffee. I just finished my morning Bible study and spent the last few minutes scheduling some pretty awesome meetings for tomorrow. I've got my to-do list written out and feeling pretty confident that I can accomplish it! Right now, baby girl is 19 weeks and 5 days along. According to my phone app, she is almost the length of a banana! Can you believe I'm almost halfway finished?! On Friday, we had a regular check-up appointment and the doctor suggested that since we are already 19 weeks that we go ahead and do the 20 week anatomy ultrasound! We were SO excited to see her again. She laid so still. She had her feet crossed just like I do when I lay down. 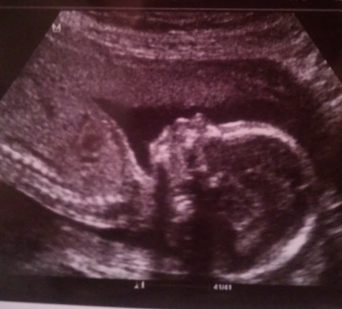 Everything looked great, she is growing right on schedule and the doctor was very pleased with her development Here's her most recent picture. Isn't she just perfect? Right now I'm finally feeling rested. We went to Disney World last week with Grant's family to celebrate the twins' 3rd birthday! Evan and Emmy are THREE! We had such great, quality time with the kiddos and with their little sister Olivia too. I need to upload some pictures from my phone, but we had a great, great trip. It wore me out though! So much walking.... we are so blessed to have such great family that we genuinely enjoy spending time with. Right now the television is off and it has been for a few days. We realized that we're watching waaaay too much TV and feeling waaaay behind on everything else in life. While we did turn it on last night to watch a few shows, the television has been off for the most part and it has made such a difference! We're just more intentional about when we turn it on and how long it stays on. During the day it is rarely on at all.